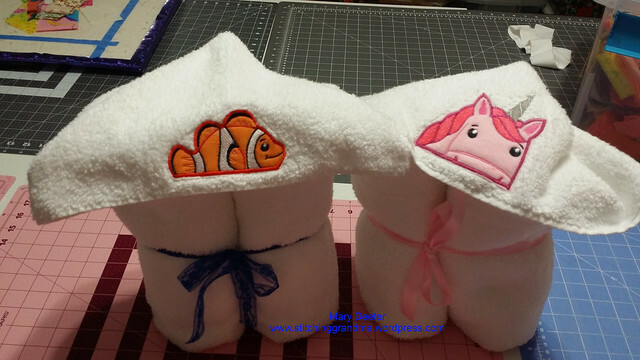 Promised my daughter I would make a couple of hooded bath towels for the youngest grandchild. She is growing so fast and those little hooded baby towels are just not big enough any more. My daughter asked for 2, and I chose the basic fluffy “white” bath towel and hand towel to use. They also have some cute designs to purchase. They have some very elaborate designs, and also offer SVG files for cutting the applique pieces. They do offer some 4×4 designs, but not many. 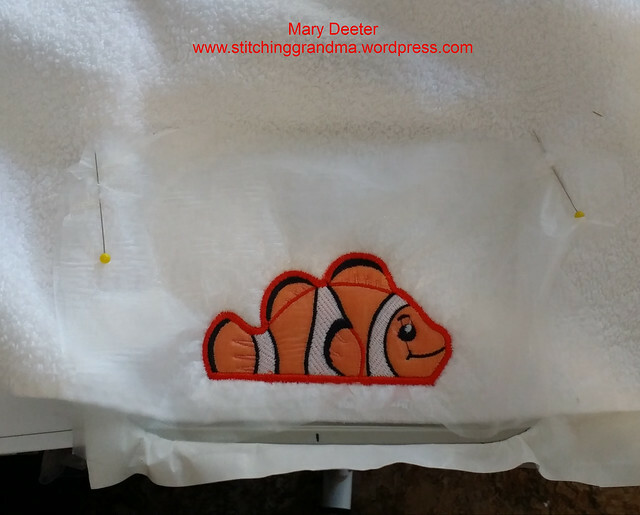 I read somewhere that if you don’t have embroidery software, you can load a sheet of paper in your hoop and “stitch out” the die line to make cutting the fabric for the applique easier. I did that for the clownfish, but not for the unicorn. 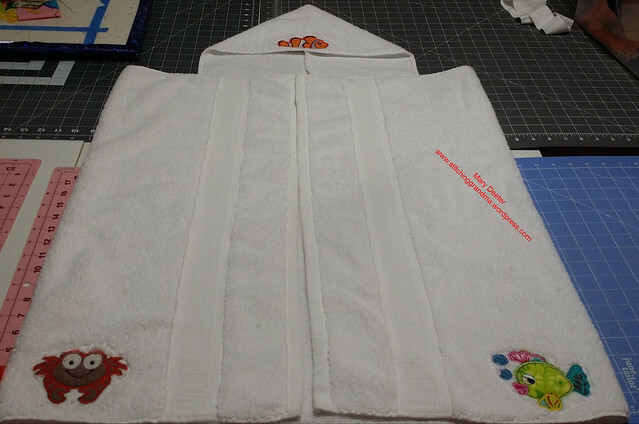 I also read that if you put water soluble stabilizer (wss) on over the toweling, then do the first die line stitch, it will help to keep from snagging the towel, plus help with the sinking stitches. I did that, and then once I set the applique fabric on top of the wss, I put a 2nd piece of wss over the applique fabric. I think it really helped the overall stitching. Another thing I did was use Floriani sticky back stabilizer, so I didn’t have to hoop the towels. I also floated a piece of tear away under the hoop. 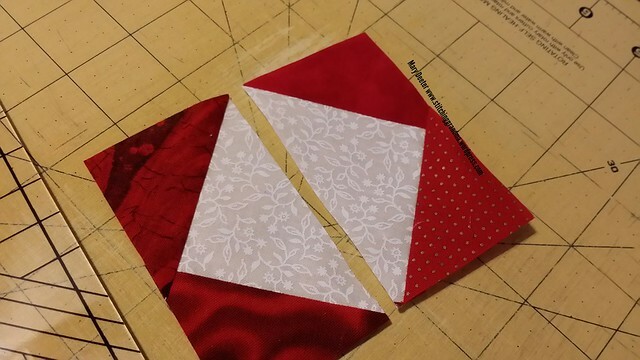 So, count the layers….4 stabilizers and the applique fabric. 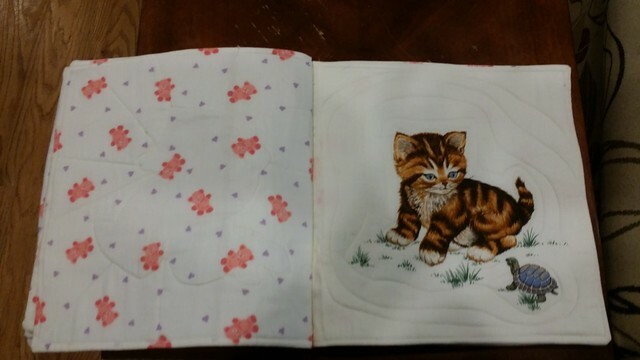 I only had 2 issues with the stitching where I had a thread break and had to go back and restitch. I am really tickled with the outcome. 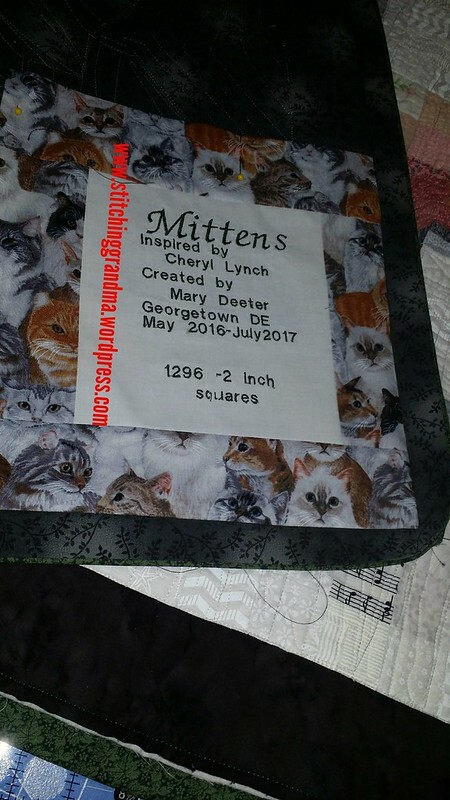 I put it on the back, stitched around the design with a straight machine stitch, then trimmed it close to the edge, then pressed it in place. This will keep the back of the design from scratching little faces and bodies. The fish on the right is from Designs by JuJu – “Sassy Fish”. I purchased that several years ago and don’t find it available now. There were 22 steps in that little design, 6 fabrics. They have a LOT of great designs, that would have worked well for this project. I love Designs by JuJu and have used many designs in the past. 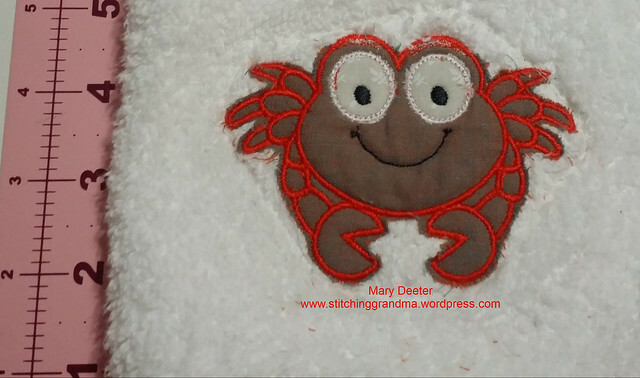 The crab applique is from OhMyCS. 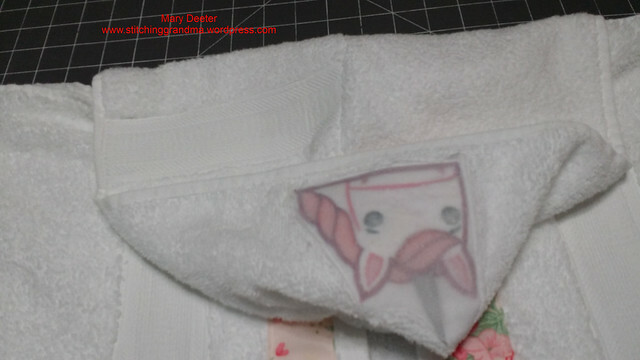 I had a challenge with it, because I did not cut the applique fabric perfectly. It came a little low and did not catch in the tack down stitching around the eyes. I ended up adding some extra stitching on my sewing machine to catch the raw edges. Also, the design had so many curves, I could not trim it well. I figured those bits will ‘fray’ in the washer and give it “character”, so it will turn out ok. I am second guessing my “ribbon” decision, and may have to replace it “down the road” if it doesn’t stand the test of time. 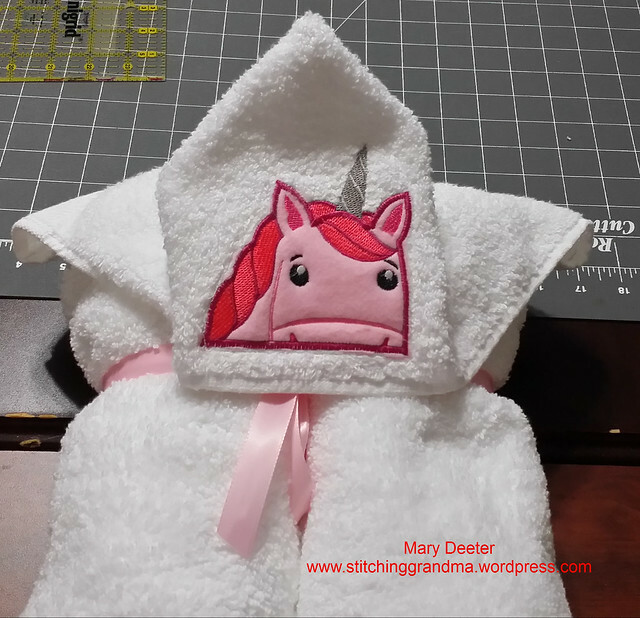 I could not find any other unicorns that would work on the white towel. (Next time I would choose a colored towel I think!) Again….trying to stop obsessing…….. Anybody that makes these to sell gets my respect! If I was to make them and put in a “craft sale”, I wouldn’t charge less than $50 a piece, as there is a lot of time in the embroidery, and construction. Then of course, I would be obsessing……looking for absolute perfection. These were made with two “medium quality” bath towels from Big Lots, and one hand towel. Of course, they are “priceless” in my opinion because I am making them for one of the grandchildren! Time to deliver this afternoon! 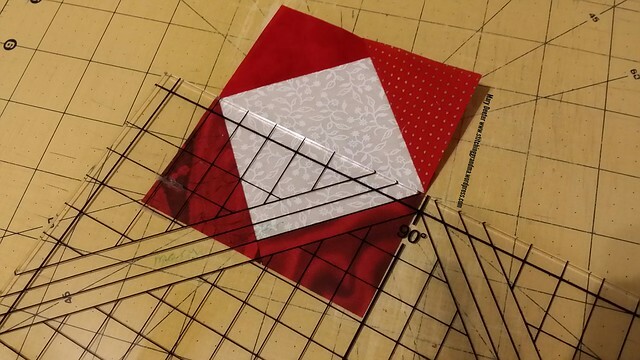 Back to quilting……………what are you working on? The last few days have been filled with good food and projects. I won’t bore you with the details, just suffice to say that since Saturday, I have been to a luncheon tea, a church shrimp & rockfish dinner, a guild pot luck luncheon, lunch at a friends house while sewing, and soup supper at church! I just love it when I get to eat different, interesting foods made by other people. The tea sandwiches were so delicious, along with scones and cheesecakes; and the shrimp was gigantic at church. Guild luncheons always bring out the best cooks, and the lunch at my friends house included a fresh baked bread, filled with ham & cheese along with strawberries and chocolate frosted brownies. Soup supper tonight at church included a wonderful Italian salad to complement the 3 soups. Aren’t they pretty? 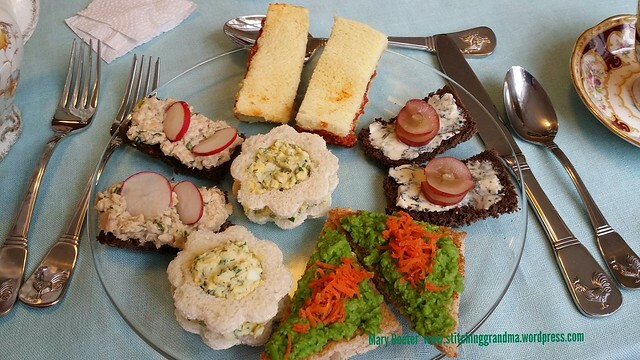 The egg salad was so delicious I used the recipe for the Guild luncheon on Monday. 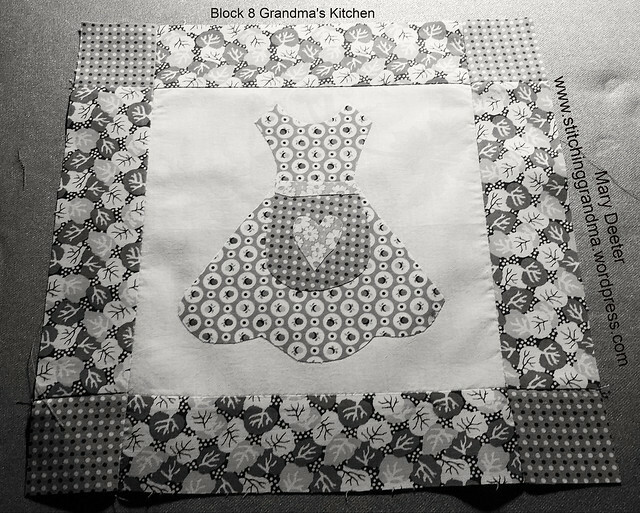 In between these lovely meals I have been enjoying a few sewing projects. Tuesday at my friend Pam’s house, 3 of us got together and made these fantastic bags using 5″ charm squares. 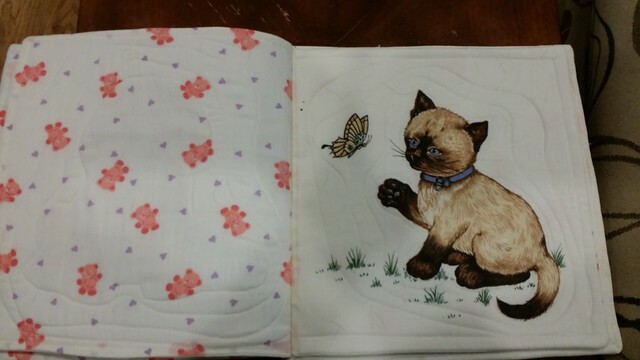 The pattern is by Penny Sturges and is called Chubby Charmer. I, of course, opened my Scrap Storage System boxes and pulled from the stack of already cut 5″ squares, and collected enough coordinating colors for the project, and opened my “blue bin” of stash yardage and pulled a piece of fabric, circa 2011. Yes, the tag was still on the piece from the purchase. Well aged fabric and scraps are always the most fun. 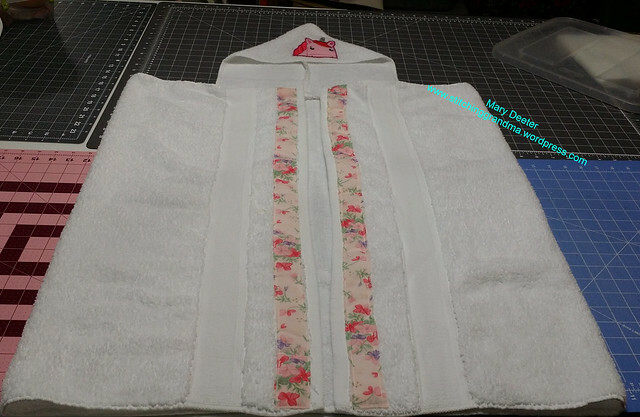 The only thing I had to purchase for the project was the fusible fleece, and I needed nearly 3 yards following the pattern instructions. 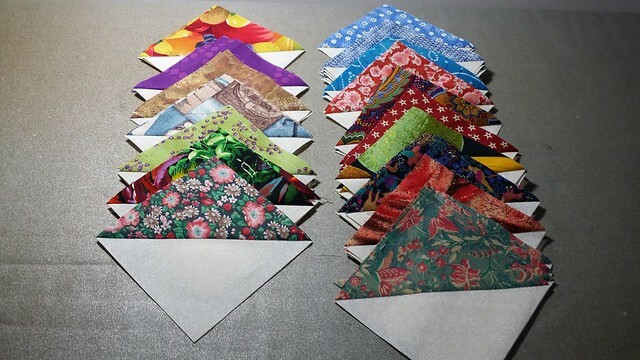 It consists of 48 – 5″ charm squares, set in a 6×4 grid on each side of the bag. The bag measures 11.5″ deep; and 9×20 “inside”. 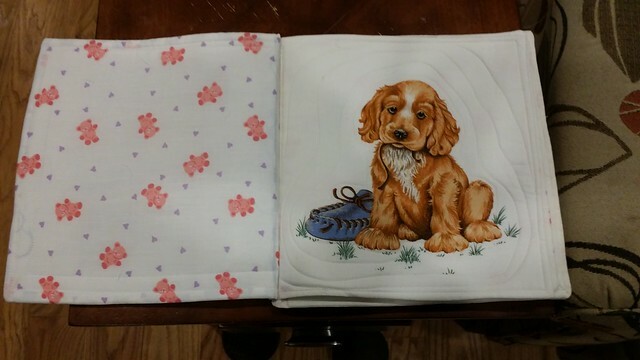 The pattern said you could put a “9×12 casserole pan” in the bottom of the bag. 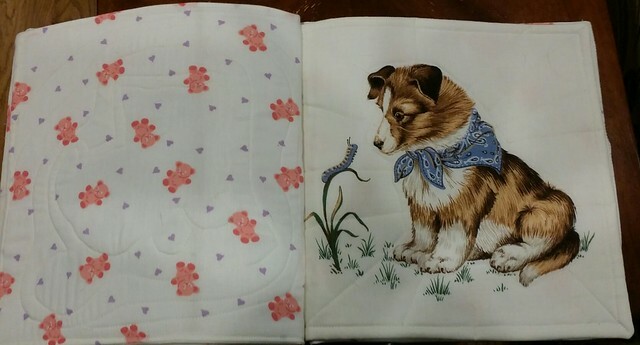 The yardage was used for the handles, the lining, and the inside pockets. There are 2 LARGE pockets inside this bag, and I decided to divide them in half when I sewed them to the lining. This is a “substantial bag” with 2 layers of fusible fleece behind the charm squares; 1 layer behind the lining, 1 layer in the pocket and handles. 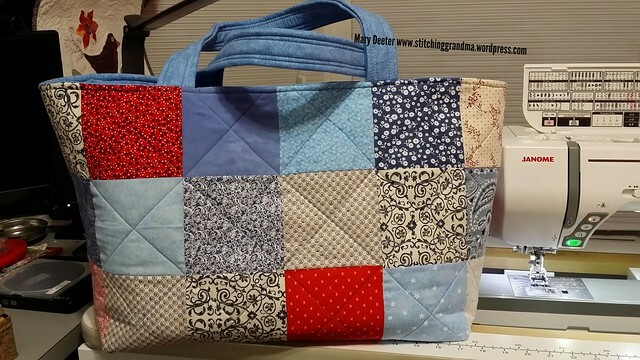 This project required a “denim needle” for the top stitching around the upper edge of the bag. I was not happy with the way my standard sewing needle was behaving when I was going thru almost 9 layers. As soon as I switched to a heavy duty (size 16) needle, it went right through all the layers along the edge where the handles are. 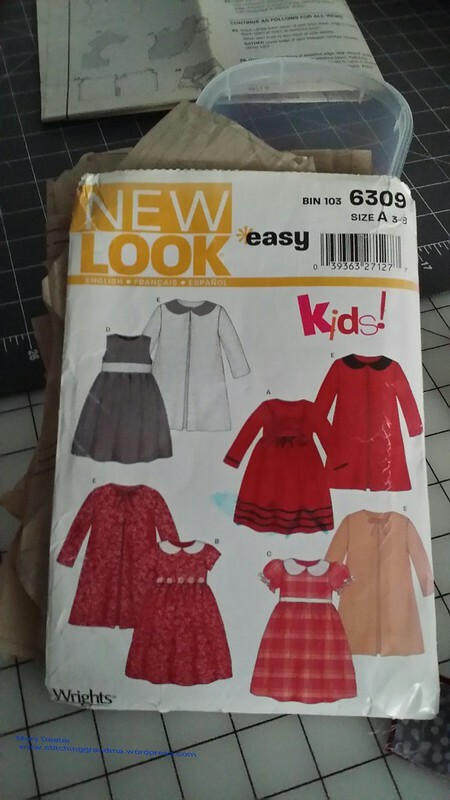 After we constructed the bags, my friend Pam made some notes on the pattern on changes for “next time”. 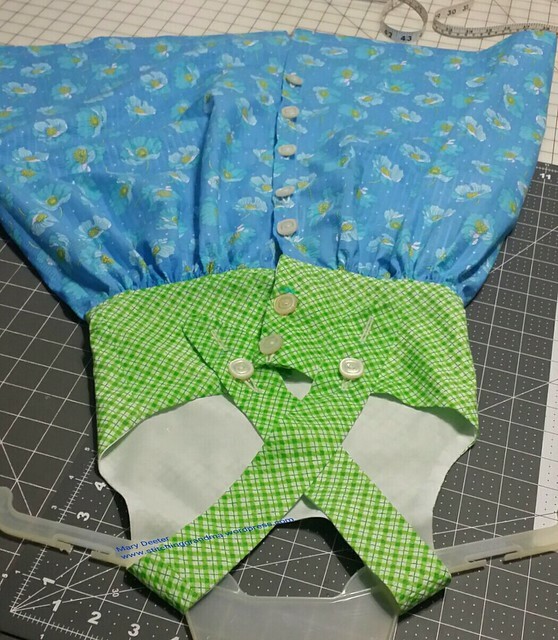 I said I would skip the fusible fleece, and use the Bosal In-R-Form in just one layer. 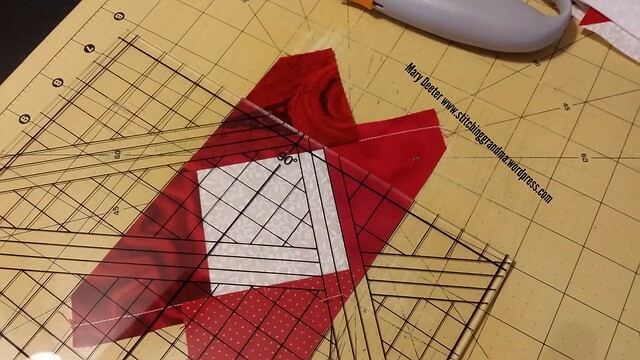 You wouldn’t have to get the fusible type, as you are quilting it to the bag, and a few pins would keep it in place until your stitching secured it. 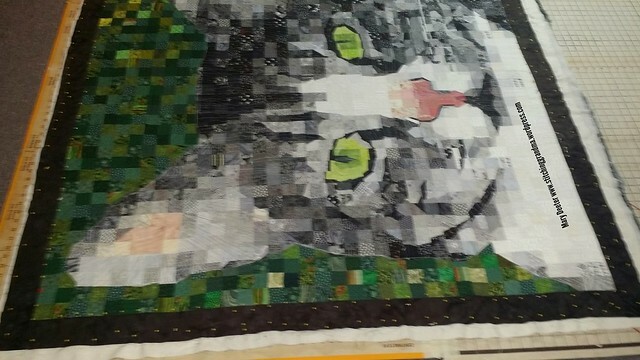 Pressing the fusible fleece in 2 layers to our panel of squares, and getting it to adhere nicely was challenging. The other thing I think I would do is make sure my fleece or the Bosal is 1/2″ smaller all around the panel; to give you a little less bulk in the seams. This bag is big enough to take a quilt to the guild for show and tell, or a bunch of supplies to a sit & sew. I had a great time with Pam & Nancy while we made our bags. All 3 of us finished the project the same day we started. Pam teased me and said I could NOT leave her house until I finished. She finished about 15 minutes before me. We started at 9 am, and I finished at 6:30 pm. We joked about making the “bag in a day” and were determined to finish. My other projects this week were to work on my flying geese for the Bonnie Hunter Talkin’ Turkey. 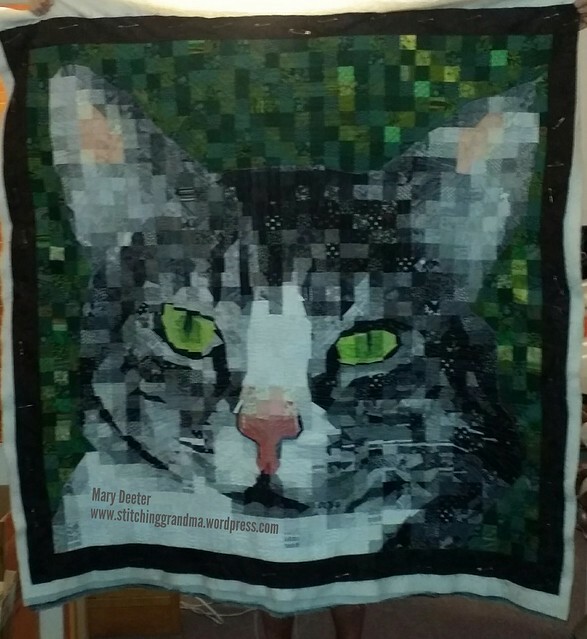 I used my Square in a Square ruler, option 3 by Jodi Barrows. (My strips are 2.5″ which is wider than need be, but what I had already cut). The first step for cutting is to put the 90 degree mark in the corner of the square. Then you do it on the opposite corner and this is what you get below. Then you do something Jodi calls the “Texas two step” – you SHIFT the ruler two lines over from the 90 degree point for the other two corners. and then you trim the opposite sides. I am ready to “cut through the white square” to get 2 perfect flying geese units. 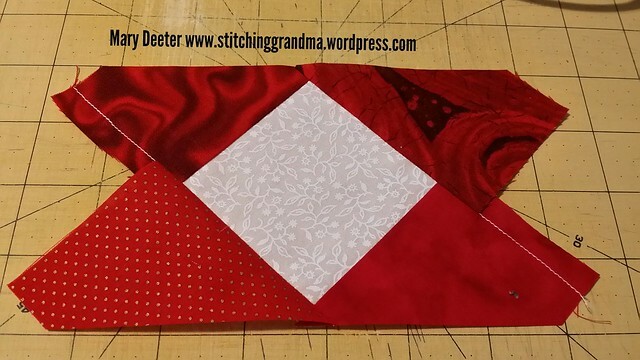 In summary, by putting the 90 degree in the corner of the white square, you end up with a perfect 1/4″ seam allowance for the top of the goose, and you won’t loose it’s point when you stitch it in the block of the quilt. The Texas Two step on the other two points eliminates that seam allowance, because the side of the wings will be in the seam allowance. I’ve put links in a previous post to Jodi’s website and you tube videos on how the ruler is used. I just thought I would share some close up photo’s of the ones I am making. I have about 20 left to trim and then I will have my 240 that I need for this part of the project. 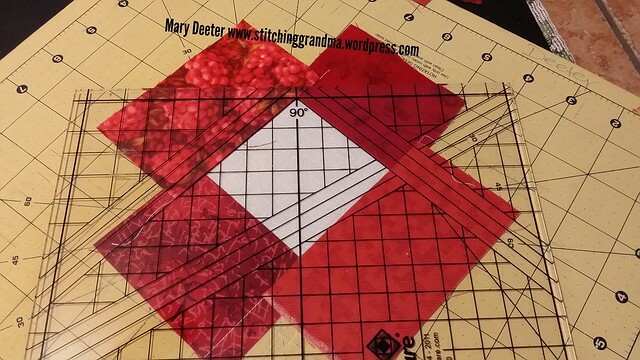 My next round of flying geese is for the border of the quilt and they will be red geese with white wings, and there will be a couple of hundred in that round! I haven’t “stuffed” him yet, as I need to use tweezers to get the stuffing through the opening left by the embroidery machine. 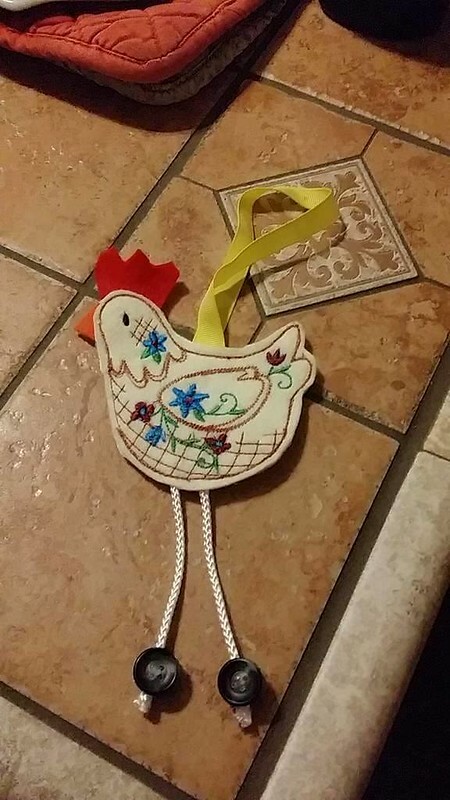 I apparently used the “WRONG” type of spray adhesive, as I spent 3 hours making this little gem of a chicken. Thread breaks, needle jams, broken needle etc because my machine HATED the spray adhesive. The stuff NEVER dried in the course of the 3 hours. Had I attended the Embroidery Club, I would have gotten those great tips they had to share about this type of problem. I wrote to the gals who lead the group and got some good feedback the next day. Maybe I will try again, but not until I get a different spray adhesive. 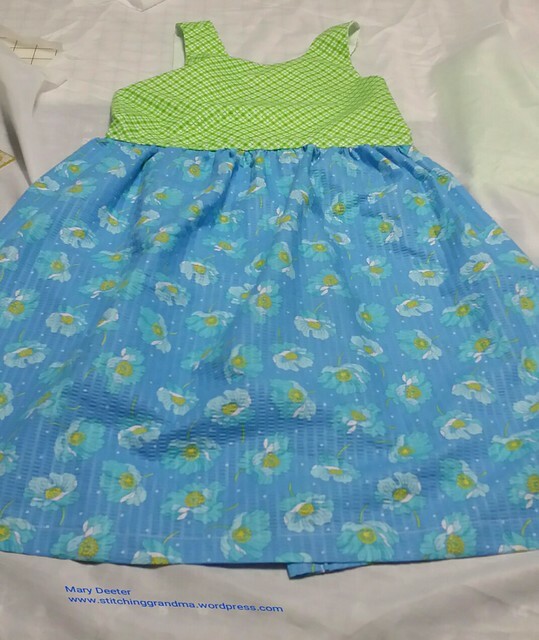 It’s been quite a while where I felt like I have done any sewing at all. Thank goodness for the Scrap Dance Two Step for March!! 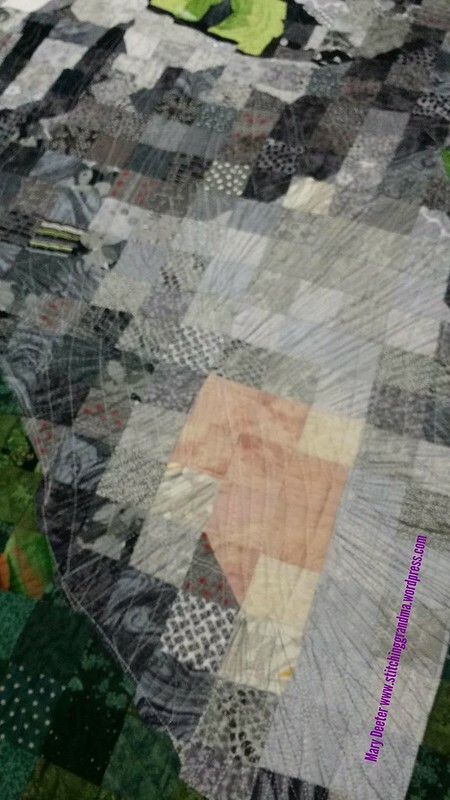 This mystery quilt run by Carole at https://frommycarolinahome.wordpress.com/2017/03/17/scrap-dance-two-step-march/ got me busy! 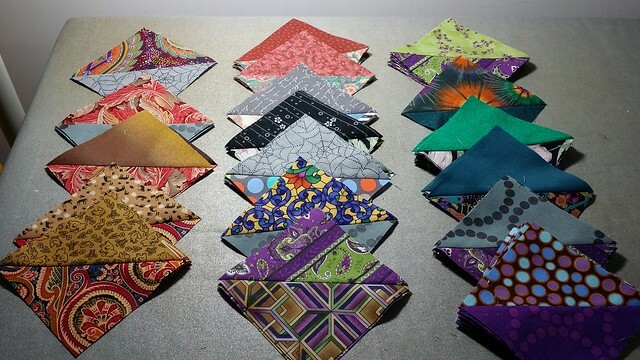 I put my half square triangles together on Friday afternoon, and finished squaring them all up today. I did have to send Carole an email and ask if I was “counting” properly. I either have extra, or I am short! 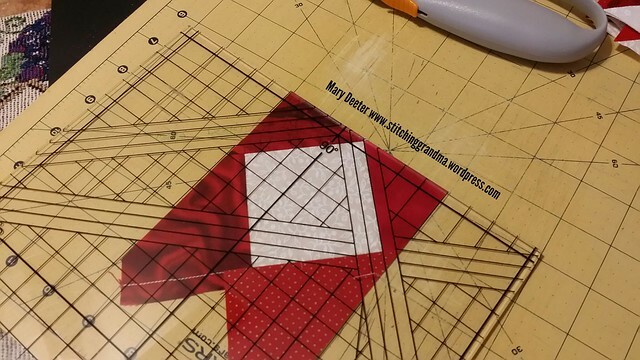 That quilter’s math on an empty stomach…. It was fun working out of the scrap bins. 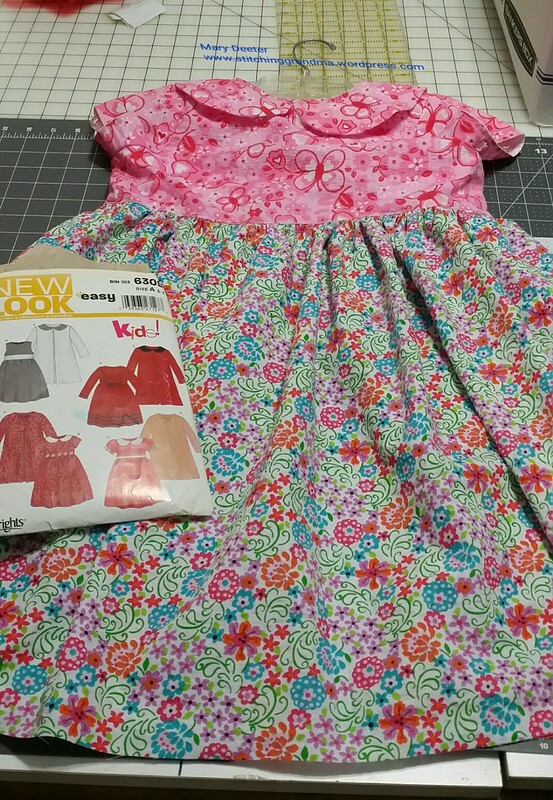 Most of my fabrics for this project were already “cut to size” when I started, coming from my scrap storage system. 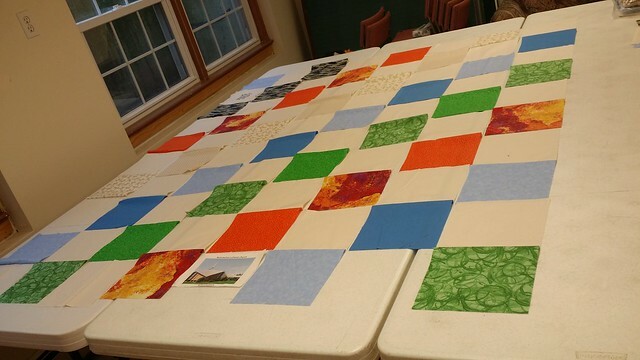 These are 8.5″ squares, and I got about 1/3 of it assembled yesterday during our workshop. It was fun sewing on my little featherweight. I did decide it is time to order that new belt the hubby suggested. 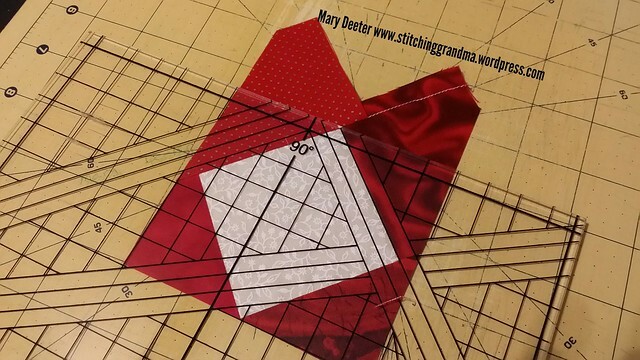 I used it on Wednesday at a sit & sew with the Material Girls, and we had a few moments of “hesitation”. Welcome to my new “readers & followers”. I don’t say that often enough, but I am glad you found my blog and hope you will find something helpful, amusing, interesting or motivating in my posts. I started this blog over 3 years ago, and use it as a “journal of sorts” of my hobbies – which continue to expand. 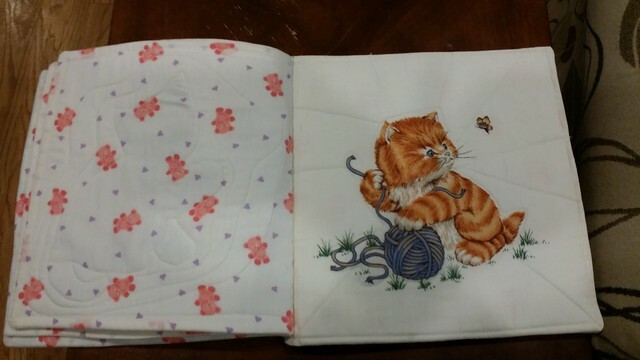 I originally wrote about quilting and sewing for the grand children; and have expanded to paper crafting, card making / stamping; and machine embroidery. (Note – I flunked out of knitting 101, so you don’t have to listen to that story unravelling). Occasionally, I will chat about other things, like domestic life, my pets and travel. 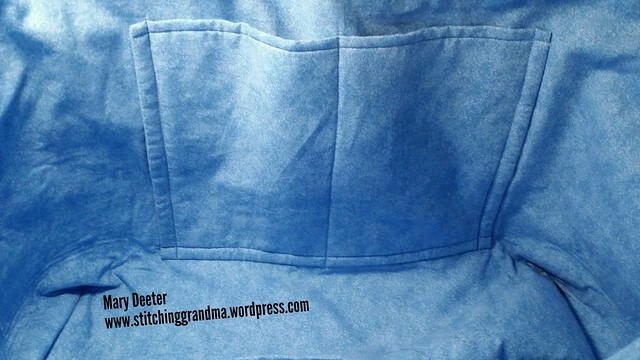 Mostly, I am a stitching grandma! I had a lot of fun on Monday, meeting ladies from Ocean Pines MD at the Embroidery Club they have established. They have been meeting for over a year, and this was my FIRST chance to go. I went immediately after the Ocean Waves Quilt Guild meeting and it was a 45 minute trip. Thank goodness I had so many helper to “pack up” the Second Time Around shopping and help me “get out the door” quickly. My wonderful husband came over to the church with my car, and swapped out for the loaded SUV, and took it home. Next month, there is a luncheon at OWQG, so I will be able to “grab my dish” and head out on time. 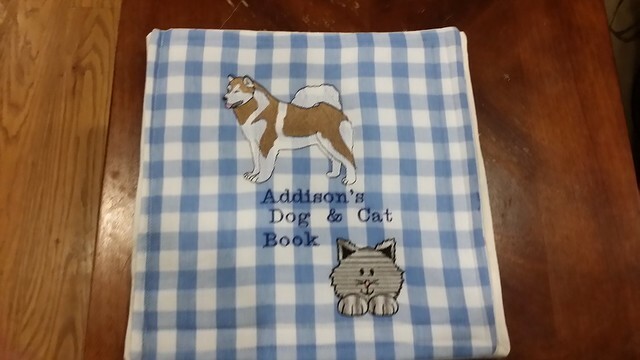 I mentioned to several ladies at the Embroidery Club that I had a blog, and had recently written about “transferring designs” between the computer and the embroidery machine. 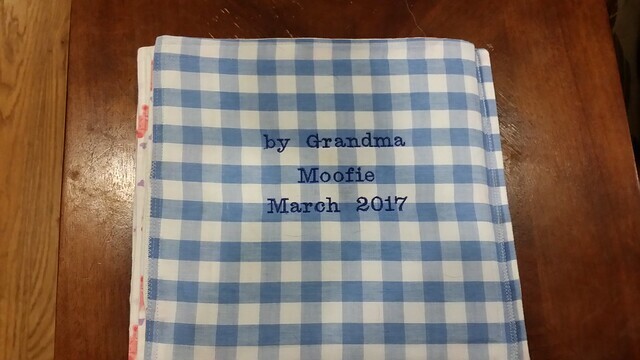 If you are interested – that blog post can be found here – https://stitchinggrandma.wordpress.com/2017/03/02/moving-files-to-the-embroidery-machine-tutorial/ . I spent yesterday attending to normal domestic life stuff, with NO sewing/stitching. 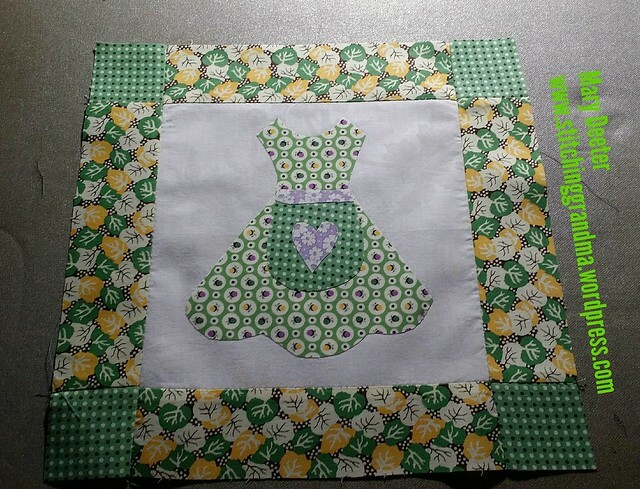 (Have I ever mentioned that I would rather sew than clean house or grocery shop???) I deserved a nice cold glass of wine after the “stuff” was taken care of, and sat out in a rocker on the front porch and watched the traffic go by! Can you believe it was 70 degrees yesterday? After dinner, I had some time to “surf” on the computer. I did find some interesting new “sources” for free designs and spent several hours downloading things. 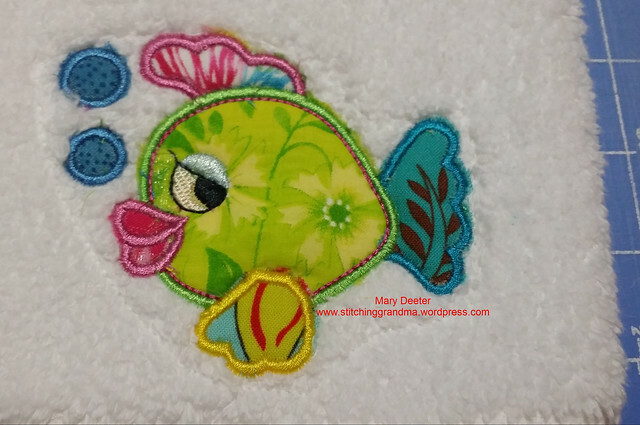 I joined a group a few months ago on Facebook – Resources for Free Machine Embroidery Designs, Sales, Tutorials, Networking . https://www.facebook.com/groups/624604440941908/ Those members share links to FREE designs. Following some of those links that had been posted on the Facebook group, I ended up at http://www.krisrhoades.com/ and picked up the cutest little elephant. (Of course, I ended up window shopping for other designs too). I also dropped by http://www.thebikestore.com/starling/index.html and picked up the mug rug pattern for March. Once I downloaded the design, I was disappointed to find it was a 5×7, too big for my machine. Oh well, I have it saved now. Then I popped over to http://missmarysembroidery.com/free-stuff-sales/ and picked up a “Luck of the Irish” free monthly design and an SVG cutting file too. Another place on Facebook that I have found free designs is StitchDelight . https://www.facebook.com/groups/StitchDelight.FREEBIES/ I’ve collected some great alphabet designs in the last month; new letter daily. This is also a group you have to “join” to be able to download. As I mentioned, I am working with a Brother PE500; which is an embroidery only machine, with a 4×4 (100mm x 100mm) capability. My machine has a “cable connection” to my computer, and uses PES files. So, no fancy photo’s today because I have stitched not a thing! Maybe later. Grandbaby # 4 is having a birthday and I saw something tempting…..
DISCLAIMER – With most of these websites & Facebook groups, you need to “subscribe” or “join” or “set up an account”. Be careful about what information you chose to share when doing this. Honestly, one of these sites wanted my “birthday”….but I was not giving up the year….too much identity information! And of course, Be careful about clicking on unknown links etc. Make sure your “virus software” is up to date and running, and scans your downloads BEFORE you open them. FYI – I have not had any problems with ANY of the links or the websites I am sharing, so if you ‘know and trust me’ you know that I won’t ever knowingly steer you wrong, but there are “evil doers” in the world who like to trick people; so be cautious when clicking on links in emails; on websites etc. Have fun with what ever you are working on today!